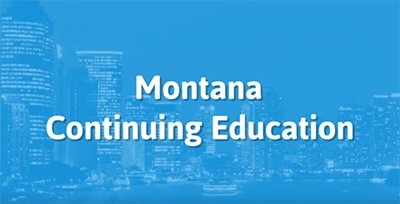 This course provides all the CE you need! This course will review key concepts and principles of Life & Health insurance, Ethics and Flood Insurance. It includes 1 hour of Legal Updates, 18 hours of Life & Health content, Ethics credit, 3 hours NFIP and the mandatory exam. No additional reporting fees. This course will apply to Insurance Adjusters as well. It will fulfill 24 of the 24 hours Montana Insurance Adjusters are required each renewal cycle. Why with all the technology these days, the Life and Health cannot be seperated?? As a Life insurance producer, I know very little about Health insurance! Why do we have to study and take tests on it? If I wanted to know all of that info about Health I would opt to sell it!!! Thank you, online made this much easier! This course was relatively easy to use. The information was relevant, and the delivery was convenient. If I could suggest one thing, it would be to have a little more video instruction included. Overall very satisfied.